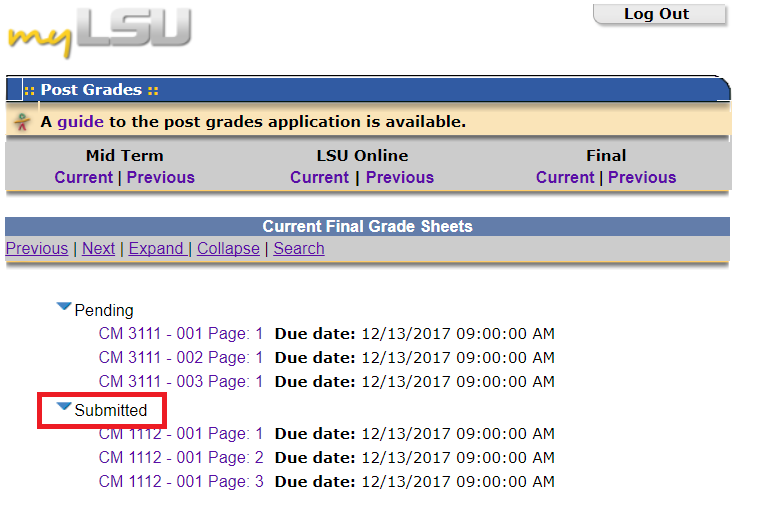 This article will walk you through Posting Grades to the Mainframe using the myLSU Portal for those instructors who are not transferring grades from the Moodle Gradebook. If would like to transfer your grades from the Moodle Gradebook, see Moodle 3: How to Post Grades? (Midterm & Finals). 2. Select Instructional Support | Post Grades. 3. From the grade posting menu, click on Current to view the current semester for the appropriate grade period (midterm or final). 4. Click the drop down arrow next to Pending, then select the appropriate class and section. 5. Choose the grade for each student by using the drop down menu in the Grade column. If a student has withdrawn, a 'W' will be the only available grade. If a student is taking the course for Pass/Fail credit, the only options available will be 'F', 'I', and 'P'. 6. Review the grades on each page. If you are not ready to submit, you may choose Finish Later. 7. Once students' grades are correct, click Submit. Each page must be submitted separately. 8. To verify the submission of grades, open the Submitted area in the myLSU Post Grades application. Submitted classes and sections will appear here.